I’ll never forget my dad’s stern voice on the other end of the phone. He was rightfully concerned for my welfare. My mom’s welfare. His grandson’s welfare. And all of our safety. The words “trip from hell” reverberated in my head for the next few days as our designated day of departure from South Carolina drew closer. I contemplated his generous offer until I discovered most airlines will not fly short-nosed breeds (our bulldog mix Agnes falls under this category) because they are prone to respiratory issues. So driving it was going to be. My husband received a job offer he couldn’t refuse last July. We discussed the opportunity over several months (the application was a long, drawn-out one) and what it would involve: us dealing with the logistics of a cross-country move and putting our house on the market. And oh, did I mention GIVING BIRTH AND PARENTING OUR FIRST CHILD!? Well, he did. And little did I know what a monstrosity it would be juggling our colicky newborn, showing our house to a circus of potential buyers and dealing with movers and packing. I look back and laugh at the outrageousness of those couple of months from when we had LG to when I left South Carolina. Driving 2,400 miles to San Diego ended up being the easiest part. With a lot of help from my mom and Agnes, we sped through seven cities in as many nights and I am somehow here to write about it. If you’re wondering why MainMan wasn’t on our trip, there was no way all five of us (three humans and two pets) were fitting in one vehicle, so we decided to split up. MainMan, his dad and Bode (our tabby cat) drove out first. MainMan started working at the end of September and my mom and I started our trip the first week of October. First, a small shout-out goes to Jillian Benfield. I don’t know her, but I found her blog post by Googling “how to drive cross-country with a baby” and I tried to follow all of her advice. I bought the exact same carseat toy bar. I found a great kid’s music CD by accident at Target and it was a lifesaver. I had never heard of Laurie Berkner before now, but she’s become a family favorite for life. We had plenty of formula for emergencies and disposable changing pads for blowouts and the scary, ghetto bathrooms we’d encounter along the way (though we did most diaper changes in the car). I’d driven cross-country with Agnes once before (and this was my third time doing it) so I didn’t have any worries about how she’d handle the trip. I just made sure I had plenty of kibble for her meals, water bowls, her fleece blanket, a sheet so she could sleep on the bed with me, this nifty dog water bottle, her favorite Trader Joe’s jerky sticks and a couple of bones she could nibble on/consume in the backseat if she got bored and started whining. If you’re ever wild enough to attempt what we did in the first few months of a newborn’s life, here are some tips in case I can be someone else’s guiding light (as Jillian was for me). 1. Keep your expectations low. Like sub-sea level low. (Are you in Death Valley? That’s not low enough.) As my dad foresaw, I planned on this drive being the trip from hell. I expected LG to cry 90 percent of the way each day. I hoped to maybe make it an hour in the car in between feedings. I didn’t know if we’d make it 75 miles each day. And my bladder is now weaker than a Chili’s margarita so I had no idea how it would be timing my potty breaks with baby’s feeding breaks and diaper changes. LG barely napped at home for any stretch at that point so we were really rolling the dice. 2. Keep the music loud and playing. My mom and I quickly discovered if we sang louder than LG cried he was likely to stop to listen to the commotion. My mom and I sang in choirs growing up so at least LG wasn’t subjected to tone/rhythm-deaf melodies. But I do hope we didn’t do permanent damage to his hearing while belting “Over in the meadow…” and other kiddie tunes throughout the rides each day (when he was awake, of course). 3. Diapers. Diapers. Diapers. Wipes. Diapers. I know this sounds counter-intuitive, but don’t count on gas stations to carry you or your LO’s favorite brands. We made sure we had plenty for the trip, and thereby minimizing Yelping the nearest Walmart/Targets at every turn. 4. For us, hotels with exterior corridors were key (as in, the kind where you can pull your car right up to your door). We wanted to be able to easily unload everyone (and everything) and settle in without the fuss of going through a lobby and/or into an elevator. We had so much stuff. Every nook and cranny of my SUV was stuffed with all kinds of baby accessories I felt we couldn’t live without. And almost every night my poor mom would unload all the bags we had shoved into my car while I nursed a baby who was tired and really disgusted at us for keeping him in a carseat for nearly five to six hours. Also, if you’re able to call ahead for a room, request corner rooms, particularly if you have a loud baby who’s waking up several times each night. There were a few places where I was afraid of our neighbors and didn’t know what would happen if they heard LG’s cries through the thin hotel walls. 5. Once you get into a groove, depending on how long your total drive is, stick to an average mileage every day. You and your co-travelers will thank you. We realized we could make it about 400 miles every day, which normally involved two or three stops. LG was such a rockstar, my mom and I were so proud of him. He really only had 2-3 unstoppable fits in the car. LG would sleep about two hours give or take after eating and getting a clean diaper. It was a miracle if we could get him to stay sleeping past the two-hour mark. And usually, like clockwork, he would start screaming the loudest when we were five to 10 minutes away from our destination for the night. 6. Having booze and meals prepped would have been really smart, but we didn’t have room for a cooler so we ate out almost every night. There were several nights where all I wanted was a beer or a glass of wine, or a really stiff martini, but I lacked the energy to seek them once we’d made it to our hotel. Some nights we had nuts and fruit for dinner because we couldn’t find anything near our hotels. 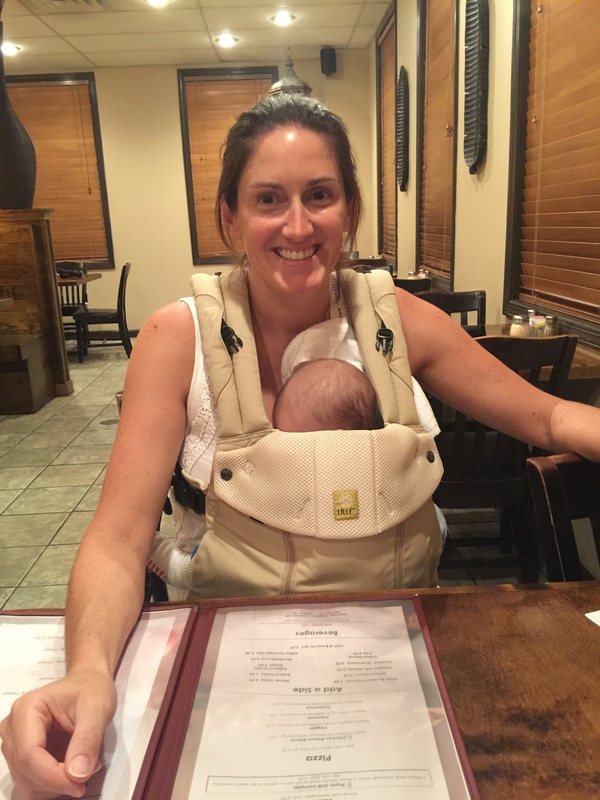 One night we braved it to a nearby Italian restaurant with LG on my stomach in the carrier, but he squealed as soon as I sat down so I ended up taking the pasta back to the hotel with me in a container while my mom finished her meal solo. The town we were in was also dry. I didn’t understand what that meant so I asked the waitress and she gave me a gentle but incredulous reply, “NO alcohol.” I also remember making my poor mom go on beer/wine runs one or two times throughout the trip. If LG was the trooper, my mom was Phyllis Nefler. 7. Don’t leave home without the portable crib, or whatever your LO is used to sleeping in, and a noisemaker. When we left South Carolina, LG was about 6 weeks old. 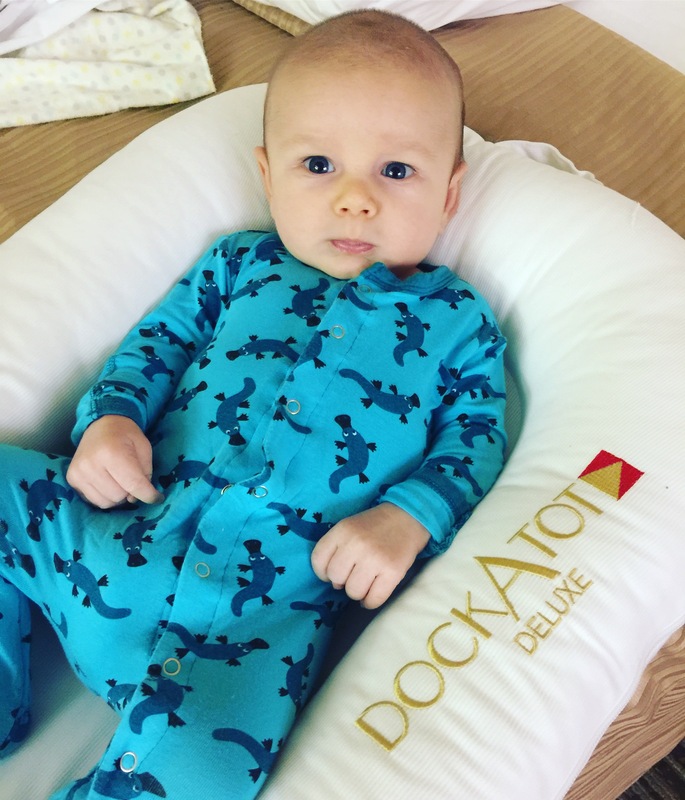 He was sleeping maybe two to three hours at a time in either the DockATot or the Rock ‘n Play. I recommend either for the littlest babies (check out the following link for more products I recommend for newborns). We would bring both into the hotel rooms each night and it was a total crapshoot which one he’d prefer sleeping in, but I liked having both options. And the noisemaker will just help them tune out what you’re doing if they go to sleep on the earlier side. 8. Disconnect your phone from your vehicle’s Bluetooth. I remember learning this the hard way when LG was passed out and I was listening to music on low and suddenly the whole car blew up for a phone call. I was so angry at myself for forgetting to do this. 9. Open windows and loud trucks are good pacifiers. I can remember a few times where I trailed a truck because I felt the loud noise soothed LG to sleep. We encountered a couple of storms on the way and my mom insisted on keeping the windows open because “He LOVES it!” I’ll tell you what I didn’t love, getting pelted in the face with rain drops. 10. 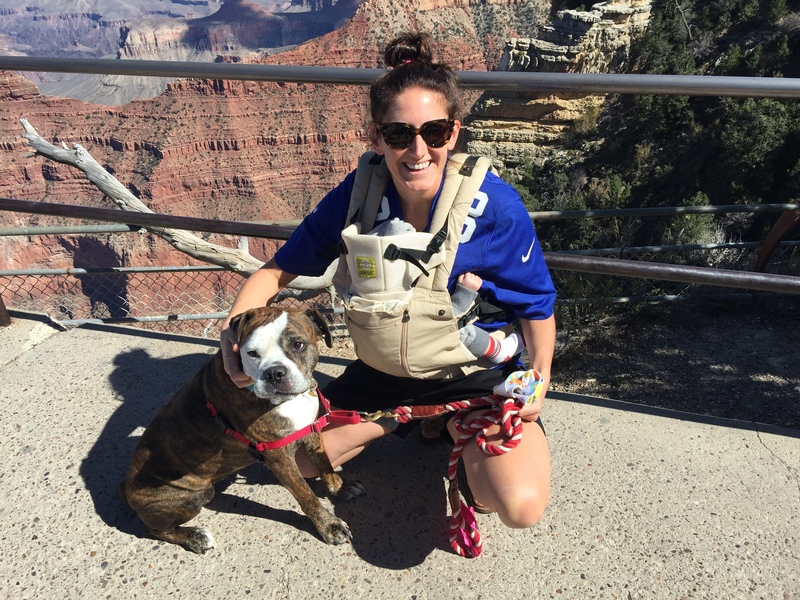 Have a few extra water bottles on hand if you plan on feeding your baby formula. This will allow your fellow adult passenger the ability to prep a bottle at any time without worrying about when the next access to a sink will be. And if you’re planning on nursing, even in a vehicle, the swaddles are key so Mr. Trucker pumping gas next to you doesn’t get a free peep show. 11. If you’re traveling with another adult, plan on them sitting in the back with your baby. We had LG’s carseat set up in the middle. It’s a bit of a back-breaker putting it into the middle spot, but worth it to have someone next to him. Even though my mom wasn’t always able to stop the tears, I think it would have been much worse had LG been sitting alone in the backseat. Before the road trip we had the little backseat mirror in place — another product I recommend even if you’re not going on a road trip. 12. Have a positive attitude and keep your sense of humor. After all, everything is temporary. And while you may never forget your baby’s wailing just as you pull into a parking spot at the Grand Canyon, he won’t remember a thing. Grandma’s got this for now. 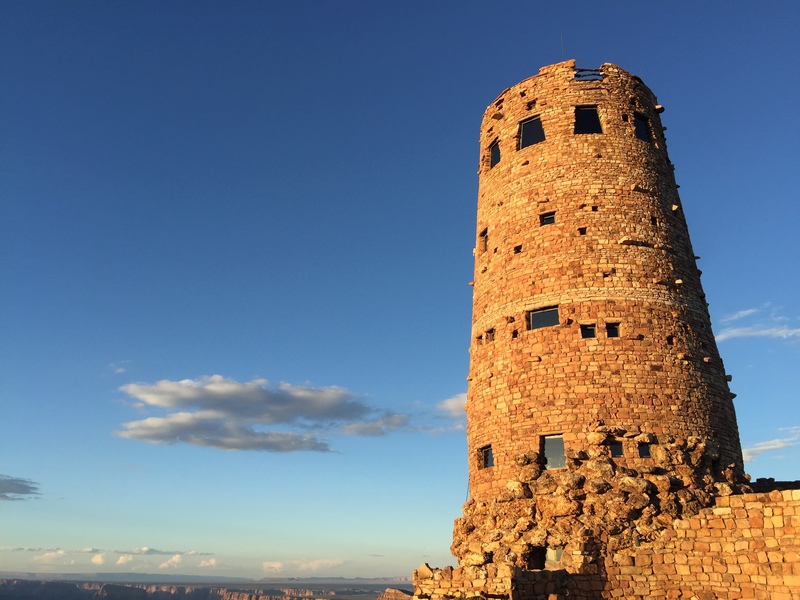 Go get that pre-sunset shot of the Desert View Watchtower. I remember laughing and crying with my mom at many points along our trip. The words “What are we thinking?” were said about a dozen times. 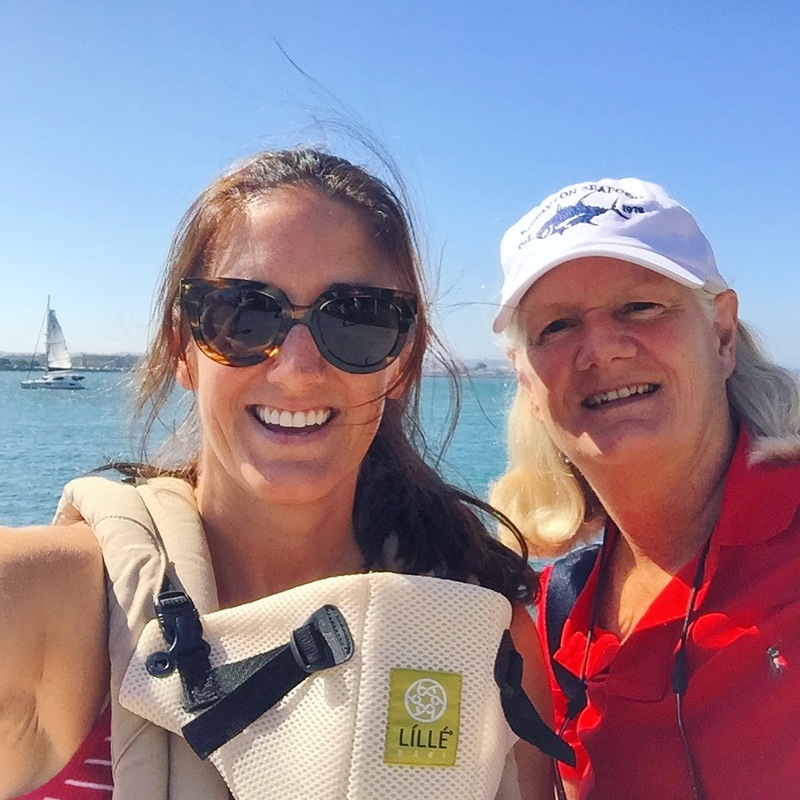 It was a relief getting to California without incident, but I remember saying to my mom on our last night as she was unpacking our belongings for the umpteenth time without complaint, “I can’t wait to get there, but as soon as we do I’m going to want to do it all over again.” The story of my life. sooo fun reading your stories! and your back in California, thats great!